Dark chocolate has many benefits: Good for your heart and your brain, as long as you are eating it in reasonable amounts (three chocolate bars at one time is not reasonable, for the record), it’s a much better option than other overly processed sweet products out there. These are all things that you can remind yourself of when you are trying to find a good excuse for eating all of this chocolate mousse in one setting. I have an obsession with melting chocolate, which is how this recipe came to be. In need of a quick dessert, melting chocolate with coconut milk for a vegan mousse concoction seemed the best idea. Never one to skimp on adding a few extra kicks to a recipe, it got a nice dose of cardamom and candied ginger as well: the ultimate combination. The grated candied ginger may sound over the top, but having tried this recipe with both chopped, candied ginger and grated, candied ginger I will say this much: it’s worth the extra effort. Put coconut milk, chocolate, and agave syrup in a small saucepan on medium heat. 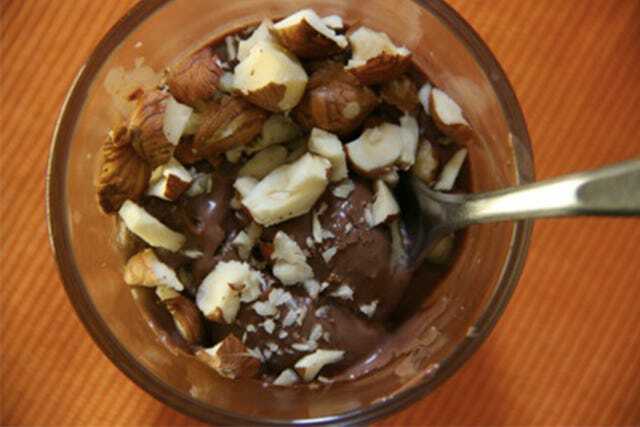 Stir constantly until chocolate is melted and thoroughly mixed with coconut milk. Stir in cardamom, ginger, and agave syrup. Place in refrigerator to chill — or the freezer if you are in a hurry.